The column '''Planets''' shows the number of the [[Planets|planet]] where the mineral can be found. This list does not include Minerals that have been obtained through [[Mineral Fusion|fusion]]. Minerals are collectibles that are obtained via Planetary Research, Mineral Fusion or from destroying planets. Each Mineral gives a permanent boost to BPS or BPC, but a player can own only one sample of each Mineral at any time. After entering a Black Hole, a new recipe is revealed, which allows the player to fuse Minerals together. 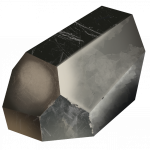 The Minerals shown on the recipe will be lost in the fusion process, but it is possible to find them again. On average, the Minerals obtained through fusion are more powerful than regular Minerals. The column Planets shows the number of the planet where the mineral can be found. This list does not include Minerals that have been obtained through fusion.